On October 27 the Drug Enforcement Agency (DEA) will hold its 14th National Consumer Drug Take-Back Day. The event will be well publicized and will enable the safe and secure disposal of millions of pounds of expired and unneeded prescription medications. On that same day, 175 Americans will die from drug ­overdoses. Despite increased public awareness, the availability of federal funds for prevention and treatment, and the formation of any number of local task forces and initiatives, the opioid abuse crisis facing America is still just that — a crisis. While some states report progress in their efforts to reduce overdoses and increase addiction treatment, the opioid epidemic continues to sow a widening swath of human and economic destruction across the country. According to the latest estimates from The Centers for Disease Control and Prevention (CDC), close to 72,000 Americans died from drug overdoses in 2017. (The final figures aren’t in.) That’s up more than 10% from the 63,600 fatal overdoses recorded for 2016, and it’s unsettling to think what the figures for 2018 will show. The need for action is obvious. However, in the face of these daunting statistics, it can be difficult to think of what can be done immediately to meaningfully address this nationwide public health emergency. Regardless, more must be done. Now. Yes, the DEA’s take-back program is vitally important, but operating only two days each year is simply not enough. Given that the CDC reports that prescription opioids account for about 40% of all fatal opioid overdoses, it’s obvious that additional efforts must be made to remove properly prescribed, but no longer needed, medications from circulation before they go missing from the medicine cabinet and end up doing irreparable harm. 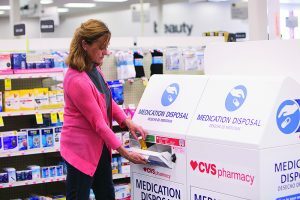 There is, of course, no one answer to the devastating problem of prescription opioid abuse and no single group more responsible than another for finding a “cure.” But pharmacy operators — strategically positioned in the health care system — have a unique opportunity to significantly impact this issue by adopting ongoing consumer drug take-back. If pharmacies fully embrace daily in-store prescription drug recovery they can measurably move the needle in this struggle to protect our nation’s well-being. And they can save lives. There are a number of take-back systems in the marketplace for pharmacy operators to consider. Some are more affordable and business-friendly than others. Some are more shopper- and patient-friendly than others. Some are comprehensive and turnkey. Some are not. But they’re out there, their differences are obvious, and pharmacy operators need to deploy them. Sooner rather than later. If an operating consumer drug take-back program is easily accessible and genuinely easy to use, current pharmacy patrons will participate. New shoppers will come to those locations where they can also participate. Too many people with too many harmful-if-abused drugs in their homes want help disposing of their unneeded medications. Pharmacies that provide that help will be rewarded with increased shopper loyalty, greater foot traffic and the satisfaction (and recognition) that comes from being a true steward of the community’s health. Consumer drug take-back has to be an ongoing, never-slowing, never-stopping effort. Every. Single. Day. If that can happen, then we’ll all benefit. Kirk Herweck is director of Pharmacy Supply Chain and Workplace Solutions at Inmar.